Read each statement in the numbered pair, then determine which best describes the sample in front of you. 3. Leaves angled in cross section --not hemlock (spruce) Hint: Try rolling the needles between your fingers. 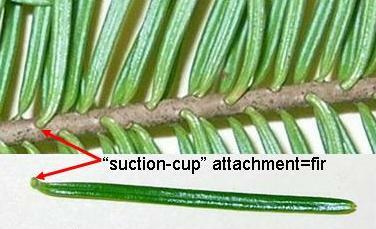 Spruce needles (angled) will roll, hemlock and fir needles (flat) will not. Needles have 2 white "racing stripes" on the underside. 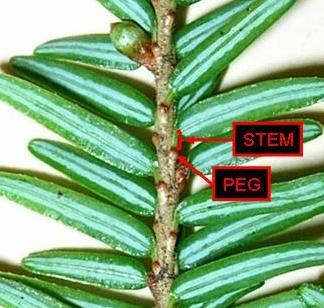 Fir needles have similar stripes. Conical to Egg-Shaped (more or less); fine branches give this tree a lacier appearance than spruce, fir or pine. The topmost branch often points away from the prevailing wind.